Adolf E. Fick, Eugene Kalt, and August Müller all produced glass scleral shells. Fick called them “Contactbrille” or contact spectacles, while Müller called them “Hornhautlinsen” or Corneal Lenses. Kalt was later the first to treat keratoconus by utilizing a glass shell approximating the radius of the normal cornea. Xavier Galezowski introduced using “plaquettes” to cover the corneal surface. These were gelatin squares soaked in mercury chloride and designed to reduce the possibility of infection after cataract surgery. This was considered the first use of a “therapeutic” contact lens. The first synthesis of a “soft” contact lens material, hydroxyethylmethacrylate (HEMA), by O. Wichterle and D. Lim (Czechoslovakian scientists) occurred in 1954. This was followed by the development of spin-casting of HEMA by Otto Wichterle, (Christmas night in 1961 using his son’s erector set). Spin-casting became an ideal way to manufacture soft contact lenses. 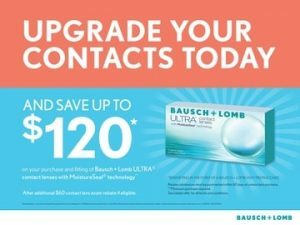 Soft contact lenses were first introduced in the United States in 1971 by Bausch and Lomb who acquired the rights to spin-casting and HEMA in 1966 from the National Patent Development Corporation.